Our patio doors offer a quality option for your Newark home improvements. They are tailored to your specifications and can open up almost any area of your home. The vast panes of glass ensure you benefit from plenty of natural light too. At Starglaze, we pride ourselves on offering a fantastic combination of quality and value. Your patio doors prices will be tailored to you and the choices you make for your Newark home, helping you to achieve the look and costs to suit you. Starglaze work with a number of incredible double glazing manufacturers to ensure our customers benefit from a range of options. You can choose from uPVC and aluminium for your new patio doors, and then we offer a number of customised features too. Our stunning patio doors are precision engineered to offer outstanding performance and durability making them cost effective too. Read on to find out more about the fantastic patio doors we offer to Newark homeowners. Our Spectus uPVC patio doors are simply superb. They come with a smooth and effortless glide system for easy opening and they can be tailored in a number of stunning finishes. You can create the perfect look for your home with rich colours and natural wood effects to suit your tastes. These patio doors offer exceptional Windows Energy Ratings, proving the great thermal performance they provide. You will be able to relax in comfort on even the coldest of days in winter with a warm and cosy home. Our uPVC patio doors are unrivalled when it comes to security. They feature the latest anti-jacking technology, anti-lift blocks, hook latches, multipoint locking systems and toughened glass. This all works together to create sliding doors that are almost impossible to break into. Our patio doors are so secure, they are even able to achieve Secured by Design accreditation for ultimate peace of mind. There are no better patio doors on the market for keeping your Newark home and family fully protected against intruders. 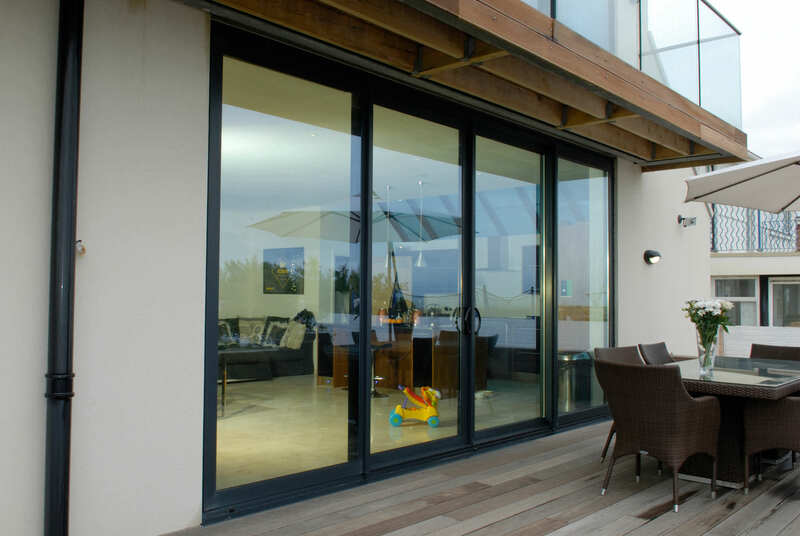 If you prefer a sleek look with ultra slim profiles, then our stunning aluminium patio doors from Smart Architectural Aluminium are the ideal choice for you. These stunning patio doors are simply exquisite and they offer superb all round performance. Aluminium is also one of the most eco-friendly options for double glazing, making them ideal for sustainable home improvements. These beautiful doors can be finished in any one of a number of RAL colours, and you can even opt for dual colours to create a truly bespoke entrance. You can opt to have one shade on the inside to blend with your décor and another on the outside to complement the appearance of your property. Our full range of patio doors offers a long term option for your double glazing in Newark. They are highly durable, and are designed to never warp, rot or fade. You can count on many years of impeccable performance and incredible beauty. They are precision engineered to need the bare minimum of maintenance, so all you will ever have to do to keep them in optimum condition, is keep them clean. It’s easy to remove any dirt and debris, ensuring you will get many years of pleasure and performance from your new sliding doors. We offer excellent patio doors prices in Newark to create cost effective home improvements. Every quote is tailored to you and your specifications. Visit our online quoting engine for an instant guide price. Simply pick out the perfect combination of options to meet your needs and our clever system will create a tailored quote. You can also get in touch with our friendly team who will be more than happy to help you find the ideal patio doors for your Newark home improvements.